Should I Paint or Stain My Wood Fence? As summer approaches, many people are taking the time to give their wood fences some special maintenance. Leaving a wooden fence bare during the spring and summer can leave it susceptible to damage from rain and sun. A bare wooden fence is more likely to develop discoloration, can more easily become infected by pests, and has a shorter overall lifespan. So, treating your fence is essential its maintenance, but then we are left with one question: is it better to stain or to paint? Each type of fence treatment has its own unique pros and cons. The choice is ultimately up to you; which will you decide? Those who choose to paint their wood fences are usually going for a certain type of look. The great thing about paints is that they come in a wide variety of colors, so you’ll be certain to find exactly the right color to match your exterior decoration and landscaping. Garden fences look particularly charming when painted. The downside of painting your fence is that the paint will chip over time. If you are a perfectionist, then painting may not be the way to go. However, if you don’t mind occasionally touching up your fence, then painting your fence can be a wonderful way to express yourself. 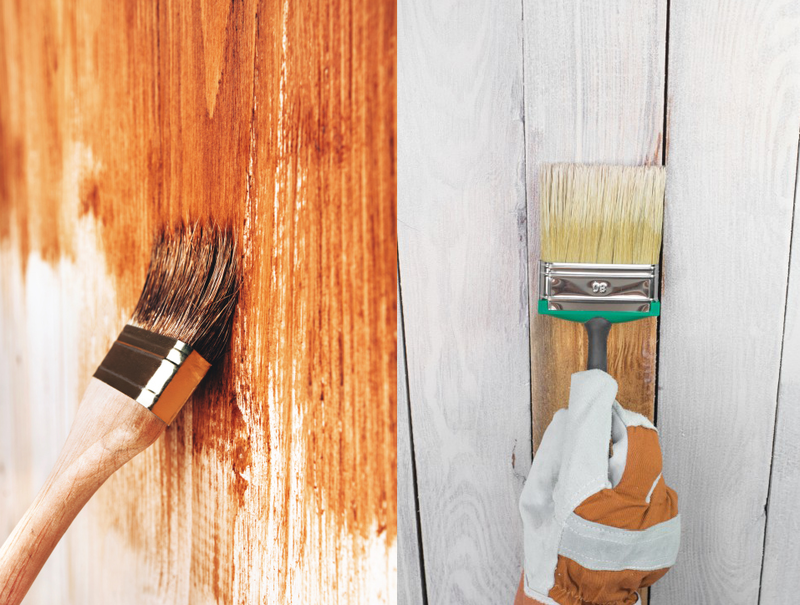 For those who want to go a more rustic or traditional route, staining is the answer. Staining a wood fence allows the natural grain of the wood to be not only visible but also accentuated by the stain. Staining a fence takes less time than painting a fence, since you don’t have to worry about putting down a primer. You will, however, have to make sure that your fence is cleaned first. The downside of staining your fence is that there is not nearly as wide a selection of colors to choose from as there are with paints. Plus, paints provide more of a protective barrier than stains. You won’t have to be constantly touching up chipped paint, but you should expect to restain your fence annually. Putting this effort into your stained wood fence can contribute to the impressiveness of your overall landscaping. With over 50 years in the fence business, we are well aware that our reputation must be earned anew every day! Since 1955, our professional team has designed and installed fences to meet the needs of a wide array of clients: residential, commercial, and government. We pride ourselves in installing high quality fences at affordable prices. Remember, if you have any questions about Hercules Fence and our community service endeavors, please feel free to contact Hercules Fence by calling (703) 551-2609 or visiting our website. Also, like us on Facebook, follow us on Twitter, put us in your Google+ circle, and watch us YouTube! This entry was posted on Friday, May 20th, 2016 at 7:02 pm. Both comments and pings are currently closed.